PRETORIA, SOUTH AFRICA — Shocking news out of South Africa – ABC News reports that double amputee Oscar Pistorius, the Olympic and Paralympic athlete known as the “blade runner” and who captured so many hearts at the London Olympics, has been taken into custody and charged with murdering his model girlfriend in his gated Pretoria home. 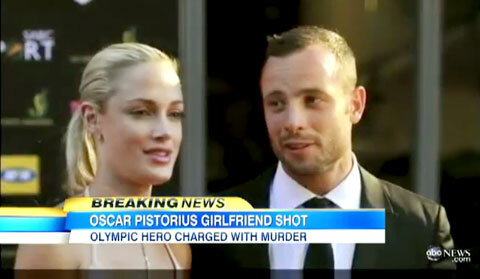 Oscar Pistorius is charged with murder in the fatal shooting of his girlfriend Reeva Steenkamp. The victim was identified as 29-year-old Reeva Steenkamp, a law graduate and model. Police reported that there was no evidence of forced entry and no other suspects were involved. Police told the media that they received a call around 3 a.m. this morning and that this wasn’t the first time domestic disturbances have been reported. BBC reporter, Andrew Harding, was at the court house and said they have witnesses and neighbors who heard an altercation at the house late last night and then heard the shots. They believe very strongly that Pistorius shot his girlfriend dead. Pistorius, a sprinter, had double below-the-knee amputations and a part of his legs has been replaced with carbon fiber blades. In 2012, he became the first double-leg amputee to participate in the Olympics, competing in the men’s 400-meter race. He also competed in the Paralympics, where he won gold medals in the men’s 400-meter race, in what became a Paralympics record. He also took the silver in the 200-meter race.